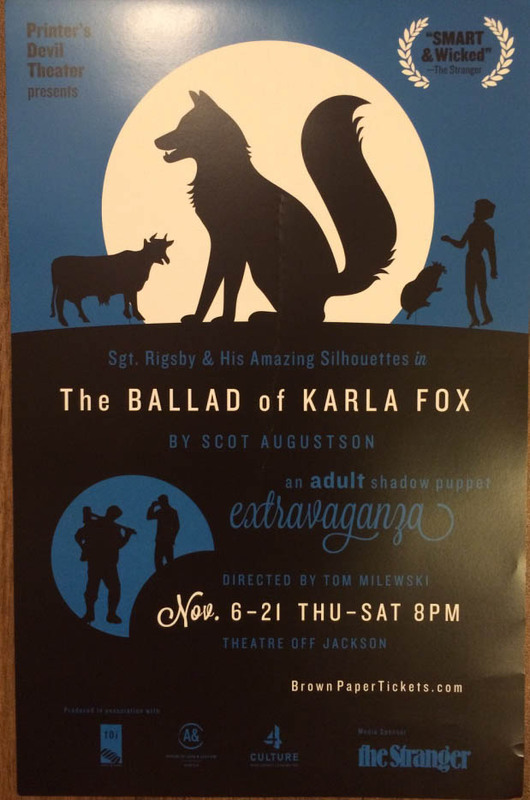 The Ballad of Karla Fox is a super intense and really dark psychological thriller/shadow puppet show. After her parents die in a suspicious accident (involving a drunken bulldog driving a moving van full of pianos) Karla Fox goes to live with her strange, stern Aunt Sadie. But soon Karla is forced to flee in the night for her very life. The young fox soon learns that trouble is everywhere in this wicked world and everybody has a terrible secret. Porcupines in doomed love affairs. Mysterious glowing waters. A child abandoned by his wild out-of-control mother. A curious friendship between a lumberjack and a widower. Karla thinks she has put all that madness behind her when she falls in love with a handsome bearcat. But she could not be more wrong. I taped the show from backstage on closing night and compressed the footage into 1 minute. Tagged sgt rigsby and his amazing silhouettes, theater, theatre off jackson. Bookmark the permalink.